Have you ever had dinner at a friend’s house and thought, there’s no way I’m going to like what they are serving. Maybe it’s just me as I’m notoriously picky but this is something I’ve thought before. One such time was at a friend’s house who was a vegetarian so she was already cooking for her needs and then she took into account my son’s nut allergy. She made sesame noodles but used sunbutter instead of the traditional peanut butter and I’ll be honest, I was slightly nervous to try it. I mean sunbutter sesame noodles just did not present a pretty visual image to my mind. Now I’m accustomed to sunbutter. We make sunbutter all the time in our house since my son can’t have peanut butter. The thought of sunbutter in a pasta dish just sounded odd to me. I guess I just couldn’t wrap my head around sunbutter sesame noodles like that… even a sauce that uses peanut butter which is pretty standard in sesame noodle dishes seemed odd to me. I think I just had no clue what I was missing out on. Then the moment arrived that I’d have to try the dish… amazingly, I liked it. What’s more the entire family liked it! I quickly grabbed her recipe and started making it at home. Of course, I did make a few tweaks to it. The sunbutter is still a key player but I swapped out soy sauce for coconut aminos to avoid the soy and changed a few of the seasoning amounts. 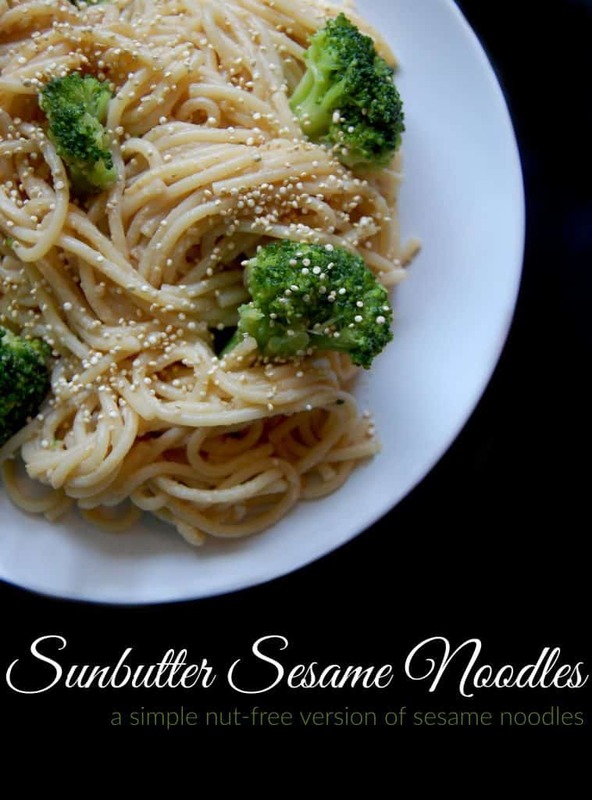 Sunbutter sesame noodles are now a favorite in our house, particularly a favorite with my kids who love to have it with lunch. This dish is nice and easy. You can whip up the sauce while the noodles and broccoli are cooking and then you just toss it all together at the end. Cook broccoli and spaghetti, drain and transfer to same pot. In a bowl, mix remaining ingredients minus sesame seeds. Pour mixture into the pasta pot and toss to coat. These noodles look so simple and delicious! I love sesame and ginger together! Brittany, two of my favorite things to eat is pasta and broccoli! I have chosen this recipe as one of my favorite 3 entries from last week’s party. Come see it tonight and link up your latest DIY posts! The party is new every Thursday at 7pm EST. Hi Brittany – Thanks for sharing this recipe with the Let’s Get Real party. I have to admit that I don’t even know what sun butter is! I am going to look it up. This sounds so yummy! Love all of these flavors. Thanks so much for sharing this with us at Savoring Saturdays linky party. Hope you’ll join us again. 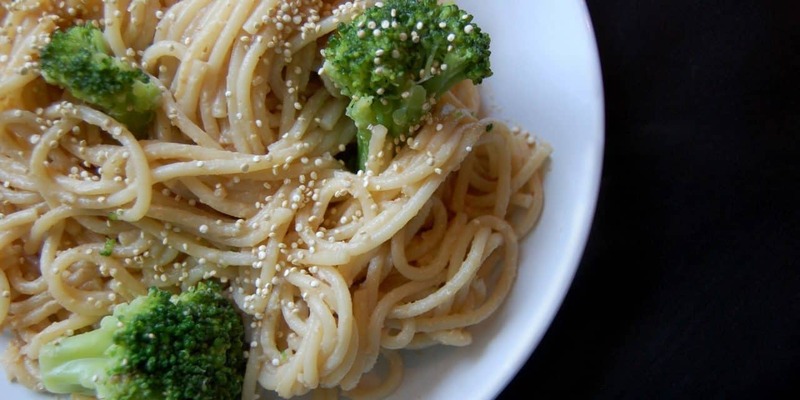 I love this recipe ( I would have it with buckwheat noodles, soba, and I would chop up the broccoli ) but the combo of the sun butter , noodles and broccoli is great!